The smoke has cleared and the dust has settled in the 2015 FIBA Asia Championship, with hosts China emerging victorious and, once again, scaling the Asian basketball mountain all the way to the top. Team Dragon completed an unbeaten run in the tournament, beating perennial contenders Korea, Jordan, Qatar, and Lebanon. Coach Gong Luming’s wards also dethroned erstwhile defending champions Iran in the Semi-Finals before eventually defeating the Philippines in a heated Final. Throughout the nine days of intense competition, there were many lessons learned, and that’s what I will detail here. Over the last couple of FIBA Asia Championships, there has been a steady increase of naturalized players seeing action for several teams. This is, no doubt, mainly because of how many teams in the past have achieved a high level of success due to the presence of naturalized players. These players usually plug the gaps in a roster, be it in the frontline (e.g. Joe Vogel, Marcus Douthit, Quincy Davis) or in the backcourt (e.g.Rasheim Wright, Jerry Johnson, Trey Johnson). This year, however, it’s very interesting to note that three of the top four teams in the 2015 FIBA Asia Championship didn’t have a naturalized player. China, Iran, and Japan had all-natural-born players, while the Philippines was the only one reinforced by a naturalized player. India, another team in the top eight, also didn’t have a naturalized player. Of the teams with naturalized players, Lebanon, Korea, and Qatar, aside from the Philippines, qualified for Quarter-Finals, while Jordan, Kazakhstan, and Chinese Taipei all finished outside the top eight. What these results imply is that, though naturalized players do add a new dimension to a team, simply having them does not guarantee dominance or victory. No team with a naturalized player, in fact, has won the Asian title since the Philippines did it in 1986 with Jeff Moore and Dennis Still. China’s winning the 2015 FIBA Asia Championship and qualifying for the 2016 Rio Olympics shouldn’t come as a surprise to anyone who has monitored Team Dragon’s preparations throughout the past six months. Coach Gong Luming first called up the national pool in March, and they trained and participated in tune-up games from that point till just before the start of the big competition in Changsha-Hunan. Many Asian hoop nuts were a little surprised that veterans likes Zhu Fanyu, Sun Yue, and Wang Shipeng were no longer part of the team, but the plan all along for China was to finally unleash the young players they’ve been grooming for the past few years. These included guys like Zhou Qi, Zhai Xiaochuan, Zhao Jiwei, and Ding Yanyuhang, all of whom have played for China’s B Teams since 2012. The long-term plan for China was always to groom these up-and-coming players and eventually have them play for the continent’s lone ticket to Rio 2016. This is the reason why China’s B Team has also been known as the “Olympic Team” these past few years. Everything came together in Changsha-Hunan, and these players showed a lot of maturity and great chemistry in playing against much more ballyhooed foes. China definitely proved that thinking long-term works. In the past four editions of the FIBA Asia Championship, a total of eight different teams have finished in the top four. Iran, China, Jordan, and Lebanon made up the top four inTianjin in 2009. It was China, Jordan, Korea, and the Philippines in 2011 in Wuhan. That was followed by Iran, the Philippines, Korea, and Chinese Taipei in Manila two years ago. This year, it was China, the Philippines, Iran, and Japan. What this tells me is that the race to Asian basketball supremacy is wide open. There are title favorites and perennial contenders, sure, but no team has been able to finish in the top four consistently in the most recent four editions. Even Iran faltered in 2011 and China fell short in 2013. This can only be good for the growth of Asian hoops, since many countries can go into a tournament thinking they have arguably as much of a shot at doing well as most other teams. It’s clear that a good level of parity has been reached. The last lesson or takeaway I have from the 2015 FIBA Asia Championship is that the future of Asian basketball is bright. 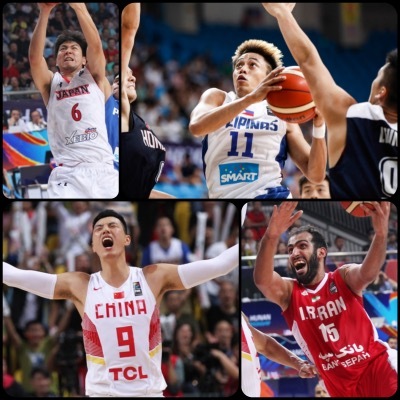 China’s Zhou Qi (19 years old) and Guo Ailun (21 years old) were able to crack the tournament’s All Star Five, while other young guns like Terrence Romeo of the Philippines (23 years old), Makoto Hiejima of Japan (25 years old), Wael Arakji of Lebanon (21 years old), and Amjyot Singh of India (23 years old) also turned a lot of heads. Each of those players was able to have his magic moment in the tournament, and there is little doubt that they will all play major roles in their respective national teams’ plans for the coming years. Remember those names, folks, because they will be the next big stars in Asian hoops. CHECK OUT OUR COVERAGE OF THE 2015 FIBA ASIA CHAMPIONSHIP!